In this lesson, we will learn how to find the distance between any two parallel lines in the coordinate plane given their equations. What is the distance between the parallel lines 𝑥 − 6 𝑦 + 1 1 = 0 and 𝑥 − 6 𝑦 + 2 2 = 0 ? What is the distance between the parallel lines − 3 𝑥 − 𝑦 + 5 = 0 and ( − 8 , − 7 ) + 𝑠 ( − 8 , 2 4 ) ? Find, to the nearest hundredth, the distance between the parallel lines 𝐿 ∶ 𝑥 + 7 9 = 𝑦 + 1 5 = 𝑧 − 7 − 6 1 and 𝐿 ∶ 𝑥 + 3 9 = 𝑦 + 1 0 5 = 𝑧 + 1 0 − 6 2 . 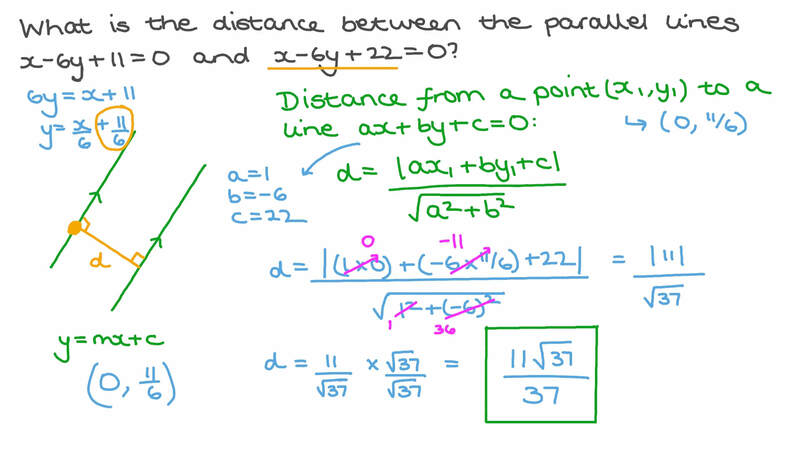 Determine the shortest distance between the two parallel lines whose equations are 𝑦 = 4 and 𝑦 = − 4 . Find the shortest distance between the two parallel lines with equations 𝑦 = 2 𝑥 − 7 and 𝑦 = 2 𝑥 + 3 . The distance between two parallel lines is √ 3 7 . If a third line is perpendicuar to both these lines, and intersects them at the points 𝐴 ( 𝑎 , 2 ) and 𝐵 ( − 1 0 , 3 ) , find all possible values of 𝑎 . What is the distance between the parallel lines 2 𝑥 + 7 𝑦 − 2 2 = 0 and 2 𝑥 + 7 𝑦 + 4 4 = 0 ? What is the distance between the parallel lines 3 𝑥 + 4 𝑦 + 1 1 = 0 and 3 𝑥 + 4 𝑦 − 2 2 = 0 ? What is the distance between the parallel lines 𝑥 − 3 𝑦 − 1 0 = 0 and 𝑥 − 3 𝑦 − 2 0 = 0 ?